HOUSTON (AP) – Former President George H.W. Bush has been hospitalized in Houston with an infection, just after attending the funeral of his wife, Barbara, a spokesman said Monday. Jim McGrath said on Twitter that the 93-year-old Bush is “responding to treatments and appears to be recovering.” He was admitted Sunday morning to Houston Methodist Hospital after an infection spread to his blood, McGrath said. Barbara Bush was laid to rest Saturday in a ceremony attended by her husband and former presidents Bill Clinton, Barack Obama, George W. Bush and their wives, along with current first lady Melania Trump. She was 92, and she and her husband had been married 73 years – the longest presidential marriage in U.S. history. 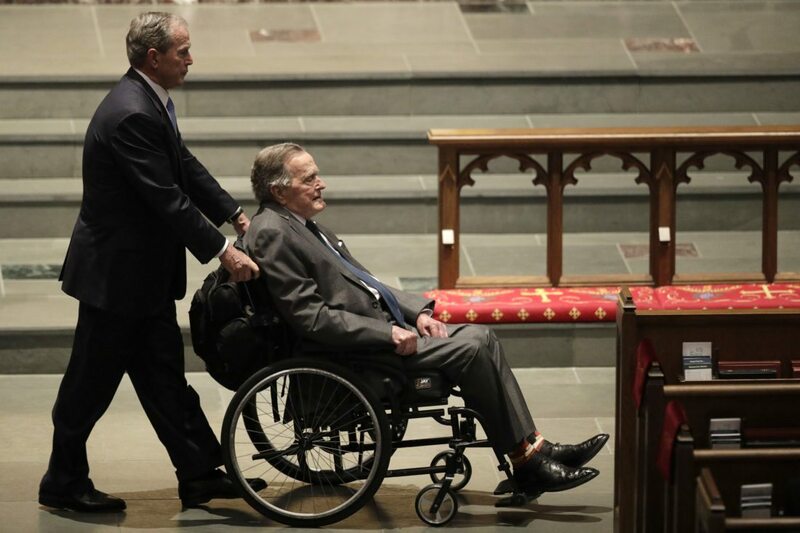 The elder Bush uses a wheelchair and an electric scooter for mobility after developing a form of Parkinson’s disease, and he has needed hospital treatment several times in recent years for respiratory problems. He attended the funeral wearing a pair of knitted socks decorated in blue, red and yellow books – a tribute to his late wife’s work promoting literacy. On Friday, during the public viewing of Barbara Bush’s casket, George H.W. Bush offered his hand to many of the around 2,500 people who walked through the church to pay their respects. A year ago this month, Bush spent two weeks in the hospital for treatment of pneumonia and chronic bronchitis, a constant irritation of the lining of tubes that carry air to one’s lungs. Bush’s doctors said chronic bronchitis is a condition more prevalent with age and can aggravate the symptoms of pneumonia. Bush was hospitalized for 16 days in January 2017 for pneumonia. During that hospital stay, which included time in intensive care, doctors inserted a breathing tube and connected him to a ventilator. He also was hospitalized in 2015 in Maine after falling at home and breaking a bone in his neck, and in December 2014 for about a week for shortness of breath. He spent Christmas 2012 in intensive care for a bronchitis-related cough and other issues. George Herbert Walker Bush served as president from 1989 to 1993. Born June 12, 1924, in Milton, Massachusetts, Bush also served as a congressman, CIA director and Ronald Reagan’s vice president.